This past weekend was International Hermit and Stitch Weekend so a perfect excuse to get down to some stitching. With the crazy challenge starts out of the way, I got it hard to settle down to a particular project and it did take a day or two for me to settle down to something. I am doing the next birthday present I need Robin Hood in a stitch along with Linda so I decided the best thing would be to work on the one I need after that which is hubby’s hunting picture. This I worked on Friday and Saturday night. This is where I’d left it after its start for the crazy challenge. This is where its at after two nights, it seemed to have taken ages to get this bit done, I’m going to say its down to the scattered spacing of these stitches and it should hopefully fill in much better and quicker now. On Sunday I started a Christmas ornament that I want to get done this month as one of my goals for the month. Its from a Prairie Schooler design and I’m in no particular rush and am happy to finish this off next week. A rare change for me that something hasn’t a deadline lol. 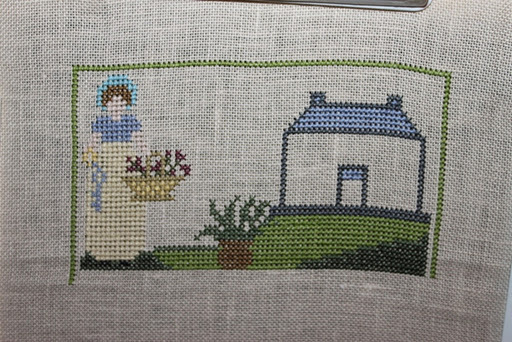 On Sunday night I went onto something that’s going to end up as a finished piece for myself and I chose to work on my Mrs Darcy Sampler..oh how I wish I could work on this some more but if I do, none of the birthday pieces will get completed on time lol. So I am doing a little, just enough to feed the soul with it, a reward so to speak for doing the birthday pieces first lol. This is where it was at the start of last nights stitching session. 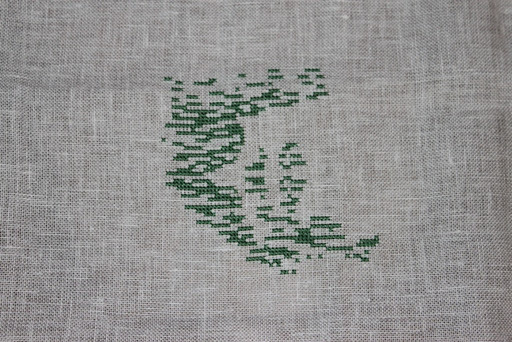 This is where I left if off at the end of last nights stitching session. I’m thinking I may leave Sunday evenings for stitching on something that’s going to be for me but we shall see. All in all I’m quite happy with all I got stitched in my weekend. Its amazing how much more I get done since I’ve cut my computer time right down so I think I shall continue to do that and we might even see the birthday pieces done before birthdays! Friday shall be a catch up with the stitch a long pieces I’m doing during the week. 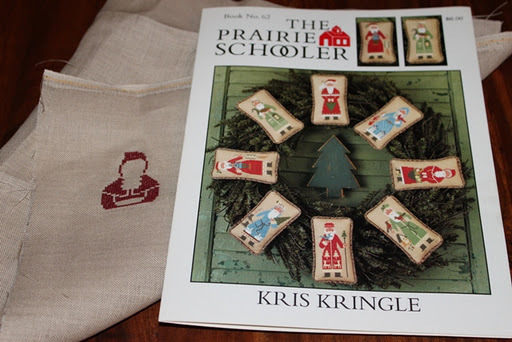 This entry was posted in Uncategorized and tagged Mrs Darcy Sampler., Prairie Schooler, Robin Hood. Bookmark the permalink. very nice stitching go girl go. question do you cross stitch this way \\\\//// that is my way, I think I was tough this way by a friend that enters cross stitch in computation. Wonderful progress, Ruth! 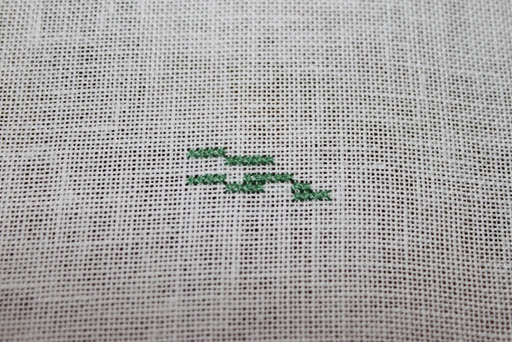 What a good idea to stitch for yourself as a small reward! You got lots done Ruth!! Lovely Mrs. Darcey sampler!! HiI've not commented on your blog before.Just wanted to say that all your wips are lovely, especially Mrs Darcey sampler. Sunday sounds like a great day to choose! Love your stitching great job! Look forward to seeing how Robin Hood turns out.Mrs Darcy is looking very pretty. 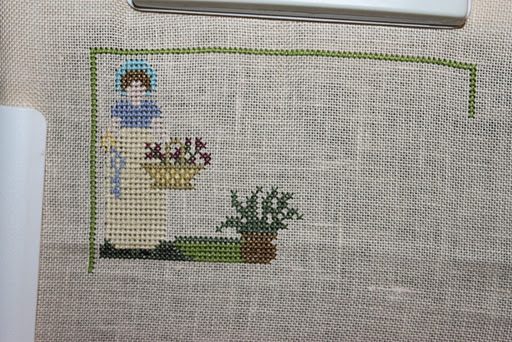 That amount of stitching is certainly inspiring look forward to visiting again I certainly want to see how Mrs Darcy looks finished. Great progress on Mrs Darcy (love the theme)! You should be happy -awesome progress, indeed! I really like your Mrs Darcy, I'll bet it's lovely when it's finished.Know what you mean about the computer, it can swallow up hours of your week, but have missed your posts!